ZeusMiner has officially announced that they are canceling the Volcano project for a 300 MHS Scrypt ASIC miner that was supposed to be released by the end of the year. This announcement does not cover only the Volcano miner, but also the GEN III upgrade boards that the company was offering as an option for December upgrade to customers with existing miners that were supposed to be based on the same new hardware. While pre-orders for hardware miners are something that has become quite risky and not many people are still interested in making such because of the lot of uncertainties about the price of LTC. Still the Volcano looked Ok, but the upgrade boards were actually more interesting for many people that have already bought older ZeusMiners as they were a good means to bring your old hardware up to date in a few months time when the initial hardware you bought may not be worth mining with anymore. However the people that actually did pre-order hardware were the ones wanting to get their hands on the Volcano miner sooner, the ones interested in the upgrade boards would probably have waited until they were released to order them directly. The reason that ZeusMiner gives as to what lead to the decision to cancel the further development of the Volcano and the new chips is that apparently most of the people want to start mining now and not wait for hardware for about two more months. The current not so favorable market situation with crypto prices keeping low and the difficulty continuing to rise is apparently why they have decided to halt the production of Volcano and GEN III Chip Blades. The good news is that unlike many other ASIC manufacturers they did not use the money from pre-orders to fund the research and development of the new chips as according to ZeusMiner all funds, which had been required for the R&D and production of Volcano, have been taken out of their own pocket. The money which they have received from the Volcano pre-orders (USD, BTC, LTC) had been set aside in secured accounts from day 1 and is still available to be returned to customers. So there should be no problems with getting a refund, should you decide that is what you want, something that is way more important than to give false promises and intentionally delay or refuse to return money to customers even after failing to deliver on promises like we’ve seen from some companies already. We have never been too keen on pre-orders of mining hardware and we’ve liked the fact that most of the Asian manufacturers of ASIC miners who were actually announcing products when they are already available for sale, unlike such companies from Europe or USA that love to take pre-oroders. Lately however we have seen that many of these Asian companies have also been tempted to offer pre-orders for hardware that is not yet ready for sale and that usually does not lead to good things as we’ve already seen. Companies usually tend to not fulfill their initial promises due to hardware production delays, issues with software and so on when they take pre-orders. So even if we are not too happy with the decision of ZeusMiner to stop the development of the new chips, they are at least doing it the right way – coming clean to users and offering an alternative or a full refund in a timely manner. 1. Transfer your Volcano/GEN III Blade order to ZeusHash with 10% discount and ZERO maintenance fees for 2 week. Discount is applied based on our Halloween Special. For example if you purchased 1 Volcano for $1,600 (plus shipping), you will be able to convert it to INSTANT ZeusHash HASHING POWER at $0.503 (1T – 9.99T range, $0.559 originally) per GHS or $ 11.691 (>1G, $12.99 originally) per MHS. 2. Refund of the FULL AMOUNT (USD/BTC/LTC) in the same way we have received your payment + 10 or 5 GHS on ZeusHash as FREE GIFT FOR YOU. All Volcano and chip blades customers will get an email from our CS team to confirm your option. If your order contains at least 1 Volcano, we will put 10 GHS into your ZeusHash account. If you ordered only Blades, 5 GHS will be given. All the transfers and refunds will be done within 2 WEEKS. If you purchased from one of our distributors, please contact our distributor for conversion/refund. Reinvesting the money you might have spend for a pre-order into the ZeusHash cloud mining service may sound like a good idea to some people, but to others it seems it is not as they will be limited to mining only either LTC or BTC directly. With a physical ASIC miner in hand you have the options to mine many other alternative crypto coins and that is one of the biggest advantages compared to cloud mining with most such services. The good thing is that you can get a full refund of what you have actually paid and maybe invest the amount in another of the announced Scrypt ASIC miners available for pre-order as an alternative option, that is if you still want to give money ahead of time to someone else. We already know that ZeusMiner is not making Bitcoin ASIC miners, however the company is also offering Bitcoin cloud hashrate for miners. To realize this feature they have partnered with some other ASIC manufacturers to supply them with the required hardware to back up the hashrate they sell to users. The same approach will probably be implemented for the LTC hashrate as well now that the company will not be finishing their next generation of chips as they have initially planned. We have asked ZeusMiner how they plan to back up their cloud service over time with faster and more energy efficient hardware and the answer we’ve got is that they are working with some partners using their expertise in chip and product design to further reduce cost as well as power consumption so that ZeusHash wouldn’t be affected. So we may soon see some more announcements for partnerships with other companies making Scrypt ASIC miners, and we are going to continue following the further development. Feel free to share your thoughts on the subject even if you have not pre-ordered a Volcano or an upgrade board with GEN III chips in the comments below. 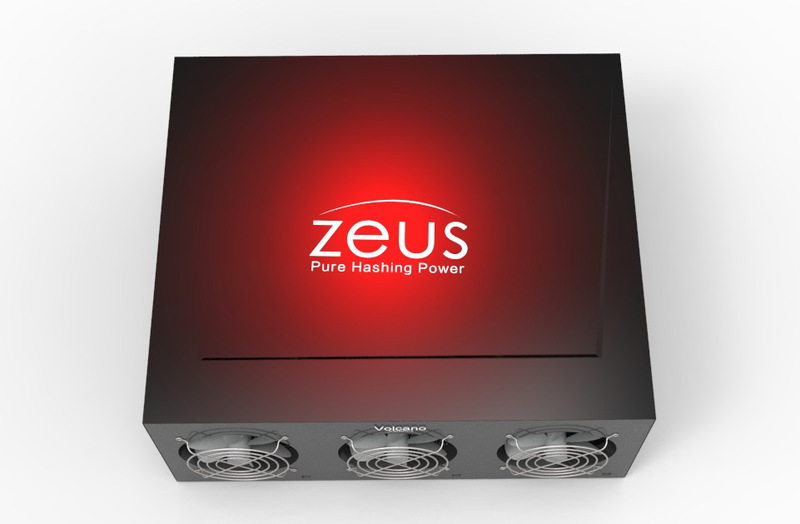 Zeus has just announced their third generation of Scrypt ASIC miners and has started taking pre-orders for end of Q4 delivery. For the moment the only Gen III miner is the ZeusMiner Volcano that should be capable of 300 MHS with just 1000W of power usage. The next generation of Scrypt mining chips should be capable of 1.2 MHS per chip and with a per chip power usage of less than 4 Watts, so a 256-chip device should be capable of providing the advertised 300 MHS hashrate. The standard price for the new ZeusMiner Volcano Scrypt ASIC is $1699 USD, however the first 500 units will be sold for a discounted price of $1599 USD and existing customers also get a $50 USD discount code in their accounts for use on Volcano orders. Furthermore if you use BTC or LTC for your payment, then you will get an extra 5% discount from the price of the miner. Zeus does provide a guarantee that they will deliver the Volcano by the end of Q4 2014, and they even back that promise by offering the customers to give an extra Volcano miner if the shipment is delayed by 1 moth or the power consumption is 50% higher than initially promised. Not a bad offer for something that you need to pre-order and pay in advance, but you should still be careful and consider well should you decide to pre-order mining hardware. As we’ve seen with the more recent pre-orders for Scrypt ASIC miners offered by companies such as KNCMiner or Alpha Technology by the time these are shipped there is a high probability that they will not even be able to ROI let alone make profit and the reason for that is the very long time it took from announcing pre-orders to the release on the market. The case with the ZeusMiner Volcano is not such however as the hardware is not so expensive and the time for delivery is not that far, furthermore Zeus has already delivered Scrypt ASIC miners. Nevertheless be careful with pre-orders and do the math carefully when deciding should you invest in a Volcano miner or not.